A little boy finds a salamander and decides he will keep it in his bedroom. 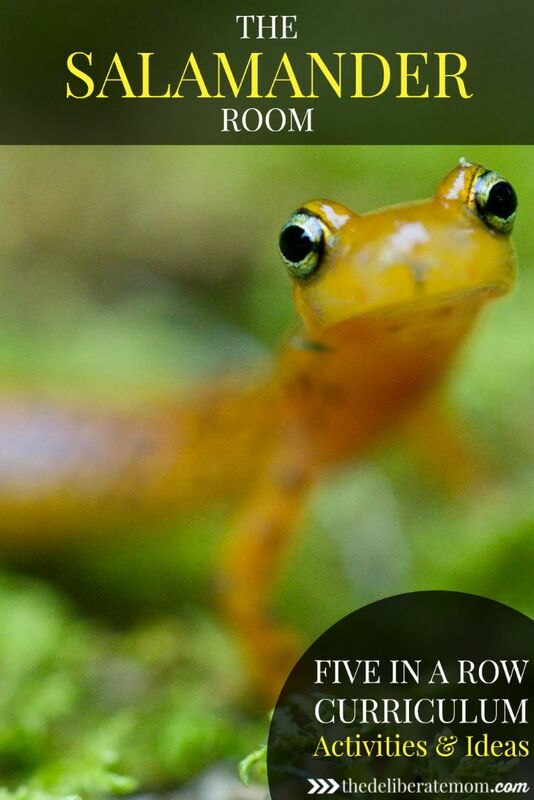 With his mom’s prompting, he reflects on what the salamander will eat, where he will sleep, and he imagines the ultimate room and space for his new little friend. This is a wildly imaginative book with beautiful illustrations! We discussed reading for knowledge. We found books that taught about salamanders and borrowed them from the library (just as it appears Brian did in the story). We discussed the parallel construction that appears in the story (through the mother and son’s verbal exchange). Then we did a visual representation of the parallel construction in the story. As I read the book, my youngest daughter would put one pebble on her side of the scale for every time the mother asked a question. 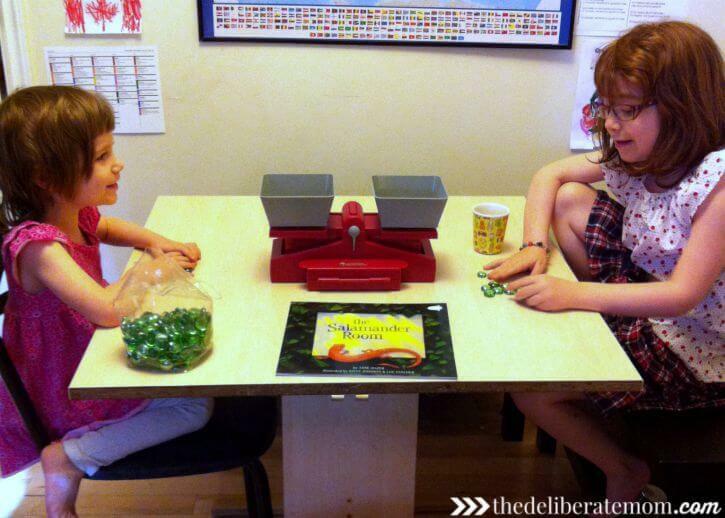 My oldest daughter would put a pebble on her side of the scale for every time the son responded to the mother. We discussed setting, specifically, the setting in this book. I also had the girls do written copy work. The free printable for the copy work is at Homeschool Share. The FIAR curriculum suggested discussing the relationship between the son and the mother. We talked about how the mother gently encouraged the boy to think about things. She never told him his ideas were ridiculous, in fact, her questions encouraged deeper thought. We discussed where salamanders lived and focused specifically on the Tiger Salamander’s habitat in Alberta. We discussed rainforests since salamanders also live there. We looked on a map and discussed where the rainforest areas are. Since we were just wrapping up our third-grade science unit on life cycles, this was the perfect opportunity to explore and discuss the life cycle of a salamander. The girls worked on a salamander life cycle flap book which we obtained from Homeschool Share. We went on a nature scavenger hunt. My oldest daughter worked on the math story problems on the printables provided by Homeschool Share. My youngest daughter counted the various insects that appeared in the book. We drew salamanders in our art journals. We made salamanders from salt dough. The project took two days because the first day we made the dough, sculpted it, and baked our salamanders. The next day we painted them. 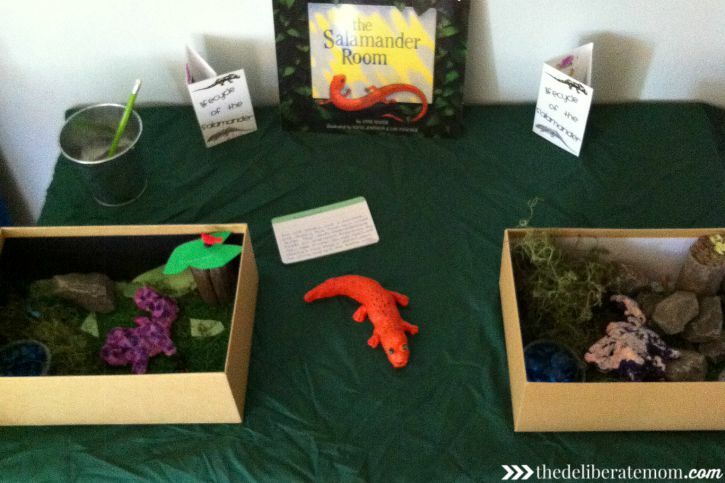 We also designed salamander rooms using shoe boxes, fake moss, rocks, twigs, and other assorted items. The final result was gorgeous! We proudly displayed our creations on our play table, took some pictures, and within a few hours all of our salamanders went missing! No, they didn’t get a life of their own… our dog ate all of them! Lesson learned. Never make anything out of salt dough and leave it within the dog’s reach. We made tropical trail mix. The girls selected a variety of dried fruits, pretzels, crackers, etc. and made tropical trail mix to eat. We went to the zoo to see if they had any salamanders there. They didn’t! 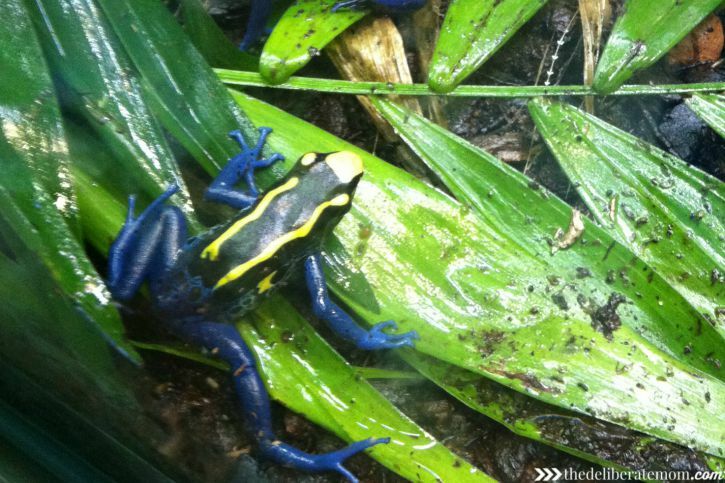 We did see some other amphibians, though… like poisonous dart frogs! The Salamander Room was a delightful book to row! There was ample content to explore, and the book was beautiful to read. I hope you’ll check in next month to see how we rowed another book! Thanks Janine! I have such fun teaching this way! What a great idea and one that you know that I will now incorporate into Madison’s learning. She just loves to read but we read because we want to read. Now I think I’m going to do this idea and also actually “teach”. She’s 3 but she’s never too young to learn. Thank you once again!! I love literacy-based learning. It’s one of my favourite ways to teach! No salamanders at the zoo? You guys really should create your own in-home salamander room… I really thought you adopted a baby salamander or something before I read through your post! LOL. I know right?! Like why wouldn’t the zoo have salamanders! Thanks Tiffany! I love literacy-based learning. It’s so much fun and it really does help the concepts stick! Thanks Caryn! I have such fun when we do our Five in a Row curriculum! My pleasure Erin! I just adore Five in a Row! Literacy-based learning is one of my favourite teaching techniques.